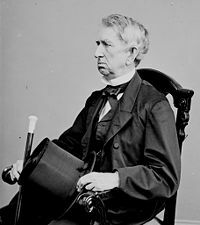 William Henry Seward, Sr. (May 16, 1801 – October 10, 1872) was a Governor of New York and United States Secretary of State under Abraham Lincoln and Andrew Johnson. He vehemently opposed slavery and was a strong supporter of the Free Soil Party. Seward was an opponent of the Fugitive Slave Act, and he defended runaway slaves in court. Seward believed that there was a "higher law" than the Constitution, claiming that slavery was morally wrong. He used this as a justification in defending runaways and in his support of personal liberty laws. In 1850 Seward voted against the Compromise of 1850 and claimed in a speech that if slavery were not abolished, America would become embroiled in a civil war. He continued to argue this point of view over the next ten years. He presented himself as the leading enemy of the Slave Power—that is the conspiracy of southern slaveowners to seize the government and defeat the progress of liberty. Although Lincoln won the Republican presidential nomination over Seward in 1860, when Lincoln appointed Seward to his most important cabinet post after winning the general election, Seward became his most loyal supporter, ally and adviser. Seward was born in Florida, New York. His parents were Dr. Samuel Sweezy Seward and Mary Jennings Seward. He attended Union College, studying law, and graduated in 1820, with high honors. He became an abolitionist, which meant he opposed the expansion of slavery and was pro-free soil, after observing the conditions of slavery while working in Georgia. During this time he married Frances Adeline Miller on October 20, 1824, after meeting in 1821. They raised six children. He later returned to New York and joined his practice with his father-in-law, Judge Elijah Miller, in Auburn, New York. He stopped his law practice to become a politician when he was elected as a Whig to the New York State Senate. In 1838, he was elected Governor of New York, serving for two terms until 1842. As a state senator and governor, Seward promoted progressive political policies including prison reform and increased spending on education, including the idea of schools for immigrants taught in their own language and by members of their own religion. 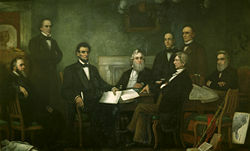 Lincoln met with his Cabinet for the first reading of the Emancipation Proclamation draft on July 22, 1862. L-R: Edwin M. Stanton, Salmon P. Chase, Abraham Lincoln, Gideon Welles, Caleb Blood Smith, William H. Seward, Montgomery Blair and Edward Bates. He was elected United States Senator as a Whig in 1848 and emerged as the leader of its anti-slavery wing. Being a fellow Whig, Seward was a friend and supporter of President Zachary Taylor's during his run for the presidency saying, "He is the most gentle-looking and amiable of men." With the decline in the fortunes of the Whig political Party, Seward joined the Republican Party in 1855 and was reelected senator from New York. 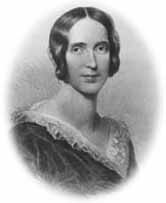 By this time Seward had moderated his views and became less associated with the group known as the Radical Republicans. Seward lost the presidential nomination to John C. Frémont in 1856. He was expected to get the nomination in 1860 but many of the delegates feared that his radical past would prevent him from winning the election. However, radicals such as Horace Greeley also opposed him because they were angry at his shift to the right. Observing events from Europe, Karl Marx, who was ideologically sympathetic to Frémont, contemptuously regarded Seward as a "Republican Richelieu" and the "Demosthenes of the Republican Party" who had sabotaged Frémont's presidential ambitions. When Abraham Lincoln won the nomination in the second round of voting at the Republican convention—after it became clear that Seward would not win in the first round—Seward loyally supported him and made a long speaking tour of the West in the autumn of 1860. 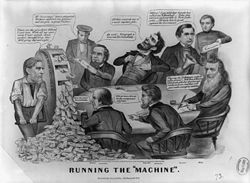 An 1864 cartoon featuring Seward, William Fessenden, Edwin Stanton, Abraham Lincoln and Gideon Welles takes a swing at the Lincoln administration. President Lincoln appointed him Secretary of State, the leading cabinet post, in 1861 and he served until 1869. For the remainder of Lincoln's life, Seward was his staunchest cabinet supporter and most trusted adviser. Many evenings, Lincoln would leave the White House to walk over to Seward's house for conversation, advice and friendship. During the American Civil War, Seward established a secret police force, which arrested thousands of citizens for disloyalty. Most who were arrested were engaged in sabotage, spying, disruption of the draft, or promoting insurrection (Neely 1991). Few were properly political prisoners, but of those who were, this was often the result of overzealous generals. As Secretary of State, he argued that the United States must move westward. He fought for the U.S. purchase of Alaska, which he finally negotiated to acquire from Russia for $7,200,000 for 586,412 square miles (1,518,800 km²) of territory (more than twice the size of Texas), on March 30, 1867. This translated into approximately two cents per acre. The purchase of this frontier land was alternately mocked as "Seward's Folly," "Seward's Icebox," and Andrew Johnson's "polar bear garden." Currently, Alaska celebrates the purchase on Seward's Day, the last Monday of March. He also engineered the annexation of the Danish Virgin Islands and the Bay of Samaná, and for American control of Panama; but the Senate did not ratify these treaties. On April 14, 1865, Lewis Powell, an associate of Lincoln assassin John Wilkes Booth, attempted to assassinate Seward the same night and same moment that Lincoln was shot. Powell gained access to Seward's home by telling a servant that he was delivering medicine for Seward who was recuperating from a carriage accident. Powell started up the stairs when then confronted by one of Seward's sons, Frederick. He told the intruder that his father was asleep and Powell began to start down the stairs, but suddenly swung around and pointed a gun at Frederick's head. After the gun misfired, Powell repeatedly swung the pistol over his head, leaving him in critical condition on the floor. Powell then burst into William Seward's bedroom and stabbed him several times in the face and neck. Powell also attacked and injured two of Seward's other children, Augustus and Fanny, a guard, and a messenger who arrived just as Powell was escaping. It is reported that when Seward awoke, his wife Frances Adeline Seward was attempting to serve him tea with a spoon. During the attack Seward was wearing a neck brace as a result of the carriage accident one month earlier, and it is said that this saved his life. However, he carried the facial scars from the attack for the remainder of his life. The events that happened that night put his wife and his daughter Fanny into complete shock and worry. Frances died in June 1865 and Fanny in October 1866. Powell was later captured and executed on July 7, 1865, along with David Herold, George Atzerodt, and Mary Surratt, three other conspirators in the Lincoln assassination. Statue of William Seward in Madison Square in New York City. 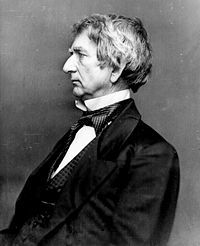 History of "William H. Seward"
This page was last modified on 21 October 2016, at 15:15.